In a series of linked pages, I will show you photographs and tell you about one of our nature journals. The binder used for the nature journal is a heavy duty half-sized 3-ring binder that has plastic sleeves on the outside for inserts. The plastic sleeves are not the important part - the important thing is that the binder is heavy duty. If your binder has inserts consider using the space for personation rather than just typing "Nature Journal" on a piece of paper. 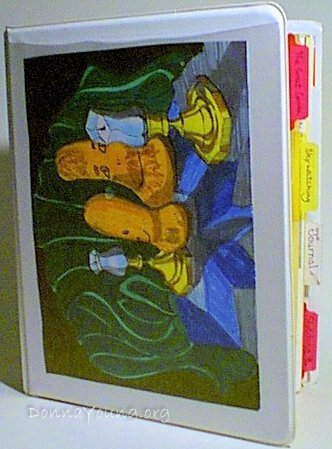 The insert in this particular journal is a drawing that I made of the children's "squash people." The children drew their dad's face on each of the squash. This journal is a half-sized journal that uses 8" x 5.5" paper. That is a regular sized piece of "printer" paper that has been cut in half. You can see the many tabs on the divider pages. Some of the divider pages were cut-to-fit from full-sized dividers and some were cut from construction paper that measured 9"x12". When cut in half to 9"x6", the 9 inch side needed to be trimmed to 8". The "tab" was formed from the 6" width by timming the width to 5.5" EXCEPT at the part where you wanted the tab. See more about this at How to Make the Nature Journal Tabs. Some of the tabs do not stick out as far as other tabs. Tabs that stick out are the main categories and the shorter tabs are the subcategories. The half sized paper is from regular printer paper that is cut in half, either before printing or after printing. When to cut the paper depends on the printable, meaning whether or not the printable is designed to be printed on 5.5" x 8" paper or on full sized paper and then trimmed. Either grow a winter squash plant or buy them from a market or your grocery store during early autumn. Get the small type, (be sure it is a type of winter squash) either like the ones pictured on the nature book cover or the small pumpkins. Allow your children to either paint things on their winter squash or draw with markers. The little pumpkins will eventually dry and shrivel. My son has one in his junk drawer that he painted in 1993 or 1994.